We set up in the corner of the Kompound Training Center near downtown Denver and got going. Because of the mats I was only able to set up one light and it had to be in a certain spot, camera right. For most of the shots that we shot with the window in the background I used a beauty dish boomed high above her, just out in front and straight on. I played with the angle of the light some until I was happy and ended up pointing the beauty dish more at me and the camera than Alysha. The end effect was some of the edginess you get from a harder, smaller light source like a reflector or beauty dish, but also some softness and forgiveness that a "feathered" light gives you, filling in some shadows so you don't lose details. It's not the first time I've feathered a beauty dish for that effect. It's a great trick to have in my back pocket. We finished up shooting some available light shots from the window since it was diffused nicely from the glass bricks. Sometimes you just can't beat natural light! After getting some shots by the window, we moved over to one of the workout stations and did a couple of setups using one of the plyometrics boxes. I used a more "traditional" lighting setup for fitness, placing a stip-box on each side behind Alysha and a 7" reflector, with a 20 degree grid, in front to camera left. For these shots I played with a white balance effect I learned from a great mentor, Dave Black. It's similar to his "moody blue" effect. Basically, you set your camera's white balance for tungsten lighting, or around 3000k, to balance the usually very warm light that a standard tungsten light gives off. The effect makes normal, daylight-balanced light much "colder" or blue than normal. To offset it on the subject you use a CTO (color temperature orange) or tungsten gel, which is what the white balance is set for. Essentially what it did was the equivalent of gelling my back lights with blue, without gels, by only using one orange gel in the front. We shot a few shots with that setup. 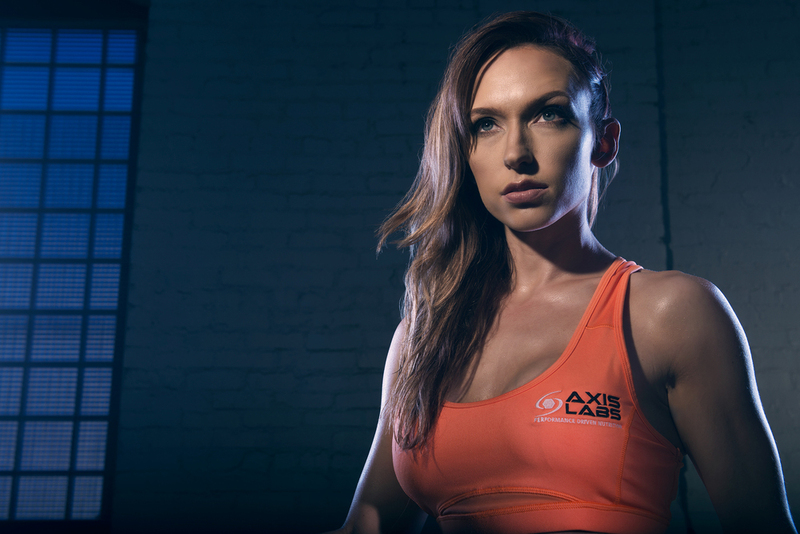 I then added a speedlight with a grid and cto to light the Axis Lab logo on Alysha's top for some portrait shots. We finished that area by just re-positioning the lights into the same setup for some shots of her working with the ropes.